While love, friends, and family are indeed close to the heart and we are scared to lose them; money at times takes priority so much so that we refrain from investing it as well and suffer from Investment Phobia. Phobias come in all shapes and sizes and most of us suffer from some form of them or the other. Some fear heights, some fear depth, some fear water while some are scared of flying. Some are scared of small places while some are scared of sprawling mansions; some fear insects and creatures while some fear crowds. Whatever they maybe there are small or big fears or phobias in almost all of us. However one such phobia that generally no one thinks to mention or feel that important is the fear of Investments or Investment Phobia. It is the fear of putting in your money in any kind of investments. It is fear that you would lose your money if you invest or you are fearful of the fact that your money will be blocked and you won’t have it when you need it; whatever your excuse for not investing, it is a type of Investment Phobia. The lingering thought that what if you need the money once it is invested and blocked. What will you do if you cannot have your money when needed? Well the simple thing is do not put all your money in the same investment type. Diversify and also keep money for meeting 3-6 months of your expenses liquid in a bank account so you have peace of mind. If you keep feeling that your money will be lost or gone if you invest it somewhere then the simple thing is to research in the kind of investment you are thinking of. If you put all your money in one stock in direct equity and if that under performs then yes you may lose out, but that is why diversification is the key to investments. If you split your investment between Bank FD, PPF, Mutual Funds etc then you will have no reason to worry. If you feel that the markets will crash as soon as you invest, then first thing the markets aren’t waiting for ‘your’ money per-se to crash. If they gotta crash they will crash it not, they won’t. Best practice is to opt for Mutual Fund and invest through SIP so you can use the power of averaging. You just keep on talking about investments and keep telling others what to do, but personally you do not; then it is a kind of subconscious fear of investments that stops you from doing it yourself. Get over it and get investing. The earlier you start, the better it is for your money to grow. If you are in the habit of merely reading and analyzing things for investments without trusting any of it, then this is investment phobia. Either stop reading and wasting time or start taking action and for your own money’s sake… INVEST! This is typical to a lot of us. The biggest excuse for not investing and letting your money lie idle. Some person lost some money because they invested in something is the typical excuse for not investing and a BIG symptom of Investment Phobia. You are not bothered about your own money, but are more concerned about their mistakes and their losses. You never know what and how they planned their investments, do you? Take the advice of a financial planner and start investing and not crib about that someone, somewhere. If you are paranoid to think of investments as something beyond bank FDs then yes you do have Investment Phobia. Bank FD is good, reliable and assured, but you need to diversify too and it is not necessary that you go for stock markets only. PPF is a great way to build a long term corpus for long term goals and is more sensible from Taxation point of view. Even if you employer gives you an EPF you should also opt for a PPF for yourself. Equity investment should also be part of your portfolio depending upon the kind of risk you can take. Feeling that blocking the money for 3-5 years will harm your financial life is a big mistake. Instead you should be worried about the investment instrument and its past performance before investing your money. If is the traditional avenues like FD and PPF and so on, then well they are secure, but if it something like a mutual fund, then you need to see past performance especially the returns given in the times when markets were really bad. Stop worrying and let your money live its life by letting it to grow the right way. 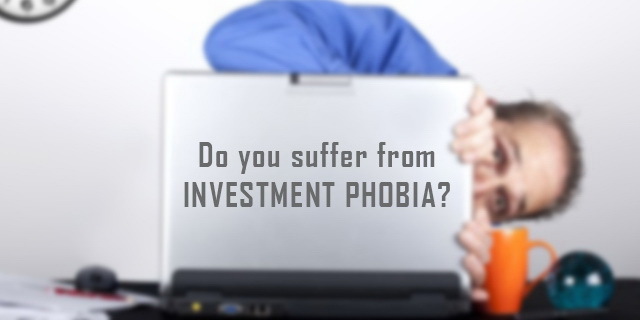 If you have any of the above feelings/symptoms you are suffering from investment phobia and it needs to be treated. The treatment is actually very simple. Just go and invest. The moment you take the first step the paranoia will slowly ease out. You will understand the dynamics of money management for your own good. You also will be able to reap the benefit of long term planning for goals like your kid’s education, home, kid’s marriage; you own retirement and so on. Investments can be quite complicated if you let them be and hence keeping them simple is essential. You need not invest in share markets or direct equity but can always take the mutual fund route for it. There is no reason to not invest in traditional things like a bank FD or PPF and so on. Balance out between short term investments and long term investments and you will have no reason to suffer from Investment Phobia anymore.